Synopsis: Pei is ruled by a wild, dangerous king (Zheng Kai). The king's military commander (Deng Chao) has fought bravely on the battlefield, but needs unique strategies to survive treachery in the king's court. 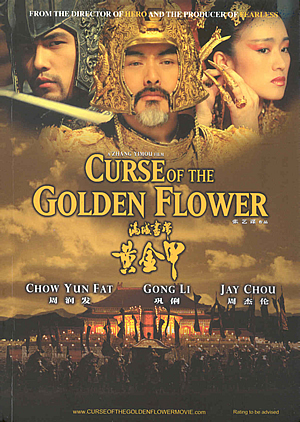 He has cultivated a "shadow" (also played by Deng), a look-alike who can fool the king, as well as Pei's enemies, when deception proves necessary. Seeking final victory over a rival kingdom for control of the walled city of Jing, the king and the commander plot a secret attack. In training with his wife (Sun Li), the commander devises unconventional, lethal ways to use Pei's signature weapons and shields. The stage is set for an unprecedented battle. 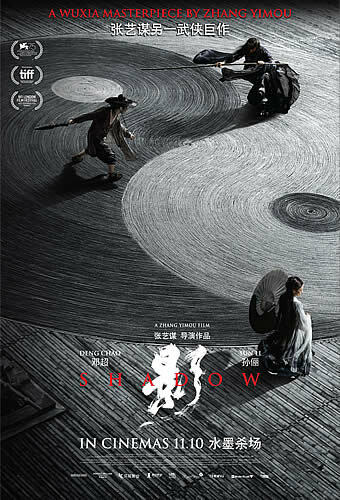 ‘Shadow’ has been praised as Chinese auteur Zhang Yimou’s return to form after 2016’s spectacle-driven ‘The Great Wall’, and we completely agree. 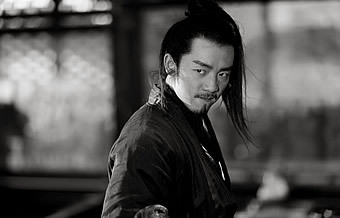 It isn’t so much that there is a film without spectacle – in fact, we would say that there is even more memorable visual spectacle here than there was in ‘The Great Wall’ – but rather that there is deep purpose, meaning and significance in ‘Shadow’ as well as every one of its gorgeously mounted shots, which makes this easily one of the best martial arts ‘wuxia’ pictures in recent time. Whereas ‘Hero’ was awash in bold colours, Zhang drains the colour almost completely in ‘Shadow’, choosing instead a distinctly monochromatic palette comprising contrasting whites, blacks and greys. 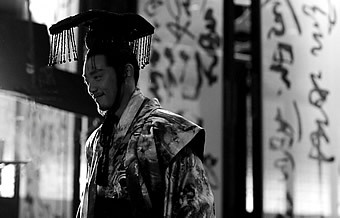 That artistic choice reverberates throughout the entire movie: the whites and blacks reflect the yin-yang duality which is the film’s recurring motif, while the infinite greys in between highlight the complexities within this intricate palace tale of power plays, dual identities and misplaced loyalties. 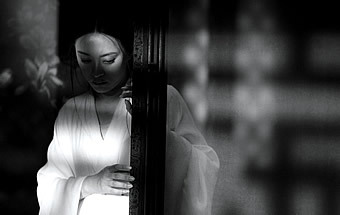 Zhang has openly said that he was inspired by traditional Chinese ink-wash painting, and this is as close a cinematic equivalent as you could ever imagine. 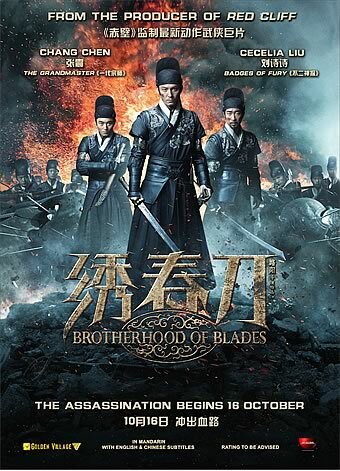 Duality is woven into the story right from the start, which finds an elaborate scheme hatched by the Pei Kingdom’s cunning military commander Yu (Deng Chao) to take back the strategic city of Jingzhou. Weakened and ailing from a terrible wound that Jingzhou’s mighty spearsman General Yang (Hu Jun) had inflicted on him previously, Yu sends his doppelganger (also played by Deng) to arrange a rematch with Yang, and in the lead-up to that duel, practices with his so-called ‘shadow’ on a huge yin-yang diagram to train him to take on Yang. 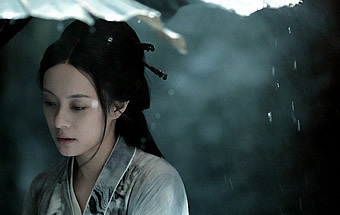 But Yu’s motivations are necessarily suspect: Yu had deliberately not sought the King’s (Zheng Kai) blessings before sending his ‘shadow’ to challenge Yang, though he is proven right that the King would never have agreed to the plan when the latter is willing even to offer the hand of his sister (Guan Xiaohong) to Yang’s son in the hopes of establishing a truce. Not surprisingly, the King is unaware that Yu had employed a body double in his place, although he becomes suspicious when Yu’s ‘shadow’ finds various excuses to turn out his request to humour him with a duet on the zither with Yu’s wife Madam (Sun Li). 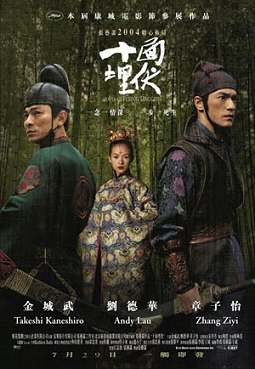 There is a lot going on in Zhang’s reimagining of a part of the ‘Three Kingdoms’ saga: there is hint of jealousy between Yu and his ‘shadow’, though some awkward moments that pass between Yu’s ‘shadow’ and Madam during their training sessions together shows Yu’s feelings may not be misplaced; there is a subplot involving Yu’s loyal deputy Captain Tian (Wang Qianyuan), who is disgusted by the King’s cowardice and is recruited by Yu for another crucial branch of his scheme to retake Jingzhou; and last but not least, there is the King himself, who is not quite so daft as not to realise that there is something fishy going on around the other power centres in his kingdom. It takes about an hour for Zhang to put all its chess pieces on the board, which involves a fair amount of exposition, but even in these talky scenes, there is an air of genuine tension as the characters set themselves up against one another. Oh yes, we assure you that it never does get boring, and among one of the standout scenes is that which Madam shows Yu how to successfully counter Yang’s ‘masculine’ moves with delicate ‘feminine’ strokes using a traditional oil-paper umbrella, as a steady stream of rain falls from the roof of the cave within which Yu has made his hideout and designed his signature ‘yin-yang’ training ground. But that is at best warm-up for the film’s piece de resistance, which comes just after the hour-mark, depicting the siege on Jingzhou city as Yu’s ‘shadow’ prepares to face off with Yang on a raised bamboo platform in a river gorge. The former first reveals the intriguing weapon of choice – an umbrella made out of semi-circular blades of iron, that can send these blades slicing through the air when twirled – which is also that which a detachment of prisoners-turned-soldiers led by Tian upturn to nestle themselves within and spin down the rain-swept main street of Jingzhou. If there was any doubt Yu wanted his ‘shadow’ to be more than just a decoy, that sequence puts these questions firmly to rest. 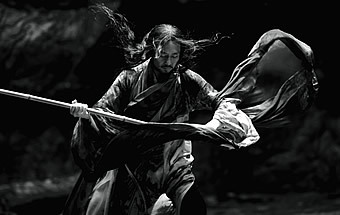 So singularly outstanding is this sequence that there is simply no way anything that comes after could have topped it, and thankfully neither Zhang or his action director Dee Dee tries; notwithstanding, the former gives the latter ample latitude to continue with the carnage wrought in that set-piece, as Yu, his ‘shadow’ and the King confront one another through a succession of bloody scenes from which no one escapes without a few major wounds. It is undeniably less exciting stuff, and at times guilty of being overly operatic, but necessary to bring the deception, duplicity and connivings of the last two acts to a satisfying close. 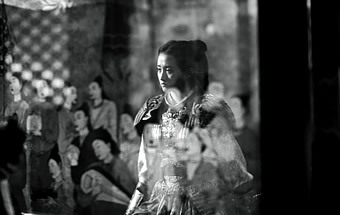 These flaws though do not diminish the accomplishments in Zhang’s beautifully mounted and philosophically fascinating period epic, which surely counts as his best film in recent time. If you enjoyed ‘Hero’ and ‘House of Flying Daggers’, you’ll surely enjoy the gorgeously choreographed sword duels here, not to mention the rest of the strikingly beautiful shots of the film’s almost bi-chrome visual universe. 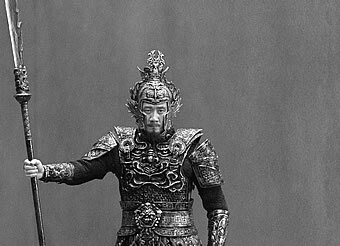 Credit goes too to Zhang’s production designer Ma Kwong-wing of elaborate interiors and rainswept exteriors, costume designer Chen Minzheng’s intricate robes and headgear, and composer Lao Zai’s (aka Loudboy) evocative classical score; oh yes, every element here is carefully calibrated like yin-and-yang, perfectly balanced against one another, so let yourself be swept away by this stunning work of art come to vivid life.